Sign up & Subscribe is a creatively designed beautiful and professional looking subscribe form. It will help you to grab your visitor's attention to introduce offers, discounts or any other kind of promotional notices. If you have a landing page that notifies visitors about an upcoming website or service it's a good idea to keep visitors hooked and make them subscribe the newsletter to receive updates. 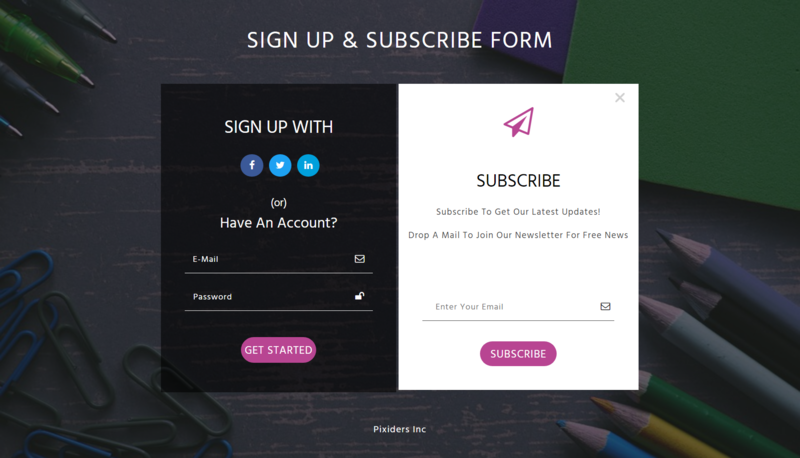 This creatively designed subscribe form has an attractive business image background on which the main form content is elegantly crafted in a slightly transparent background with social media icons. This effectively designed Enroll subscribe form is 100% responsive cross browser form, compatible on all devices, displayed on all screen sizes. It is entirely built in HTML5 and CSS3. Make it yours now by using it, downloading it and please share it.